Umm... "Europe" what? Whom? Where? When? What financial systems? What is the role of the USD as a reserve currency and how has that changed? You have no clue what you're going on about. Apparently you got brainwashed by fake news. No, I’ve been there numerous times and have been on many manufacturing factory tours. I know exactly how they play the game. Of course. That's the point. It wasn't just "a request," but "an extradition request" the meaning of which you still don't seem to understand. Come back and post after you've read these. First, I wish people who have no idea what they are talking about or do not have first hand knowledge about what is going should stop commenting and trying to make statements of fact which are not accurate. Next, the fact people do not understand the difference between developing and applying technology or using already available solutions then applying it in new innovated ways and think this is the same as just replicating exactly what someone else had already done, has never worked in product development. Yes, Apple is not always first but just because you are first does not mean what you did is innovative and people find it has value. What people do not understand about Huawei, they have been at this for a very long time, yes they employee lots of people, but those people are not innovating. They are purely copying/reverse engineering. They are worse than Samsung. No one talked about this 20 yrs ago when Huawei almost put Cisco out of business outside the US. Huawei was able to copy Cisco hardware to the point the Huawei hardware could run Cisco software. Huawei completely reversed engineered Cisco switches. I worked in the Telecom hardware industry during this time, and every network hardware company was very concerned about Huawei. During the Dot Com bust in the early 2000's where lots of design engineer were out of jobs. Huawei attempted to hire these folks to learn what they knew. I personally new one of these people who went to China and consulted with Huawei, he said they ran a 24/7 design center which focus on reverse engineering every networking product they could get their hands on, they want him to explain how and why things were designed in a specific way on products he was familiar with. Anyone who think it is any different today is kidding themselves. I worked for a different telecom company in the mid 2000's and the company found one of their proprietary communication DSP chips were being knocked off. We design the chip in house and it was fab in the US so it was not like it was transfer to China which happen most of the time. There was Asian competitor making claims their product could do what our product did. We investigated the product and had their communication DSP chip torn apart and we found it was our chip, We knew this since the designer had buried the company logo in the middle of the chip artwork. We traces the thief back to a process engineer who was responsible to how the chip was made. He was a Chinese national, he stole the chip artwork to make the IC. He did not have the original design files so could not remove the logo, but had the artwork and process recipe which allowed any fab in the world with the right technology to make the part. In this case they did not have to reverse engineer the chips, they just stool the design. My company share this information with Chinese authorities and the company that did this disappears. China does not like when one of their companies get caught red handed doing these kinds of things. The other thing people do not understand China generally sees no issue with what they are doing. They believe no one owns anything and everything can be used for the common good. I don't see anything so egregious about either of the two phones you present. I know which elements of the design you have in mind, but I don't think they are morally relevant. I wonder if the appearance of the fronts of phones should beexpected to naturally converge as the screen-to-body ratio increases. Why does China have an obligation to establish intellectual property law that's similar to the kind that exists in the West? Notches are a transitional feature. We are already seeing notchless variants and ever increasing screen to body ratios. That trio of images is not really representative of anything. Much less what he is trying to imply. Phones have camera arrays in varying orientations. There is going to be overlap in designs on occasion as design options are relatively limited. Just look at TVs today. 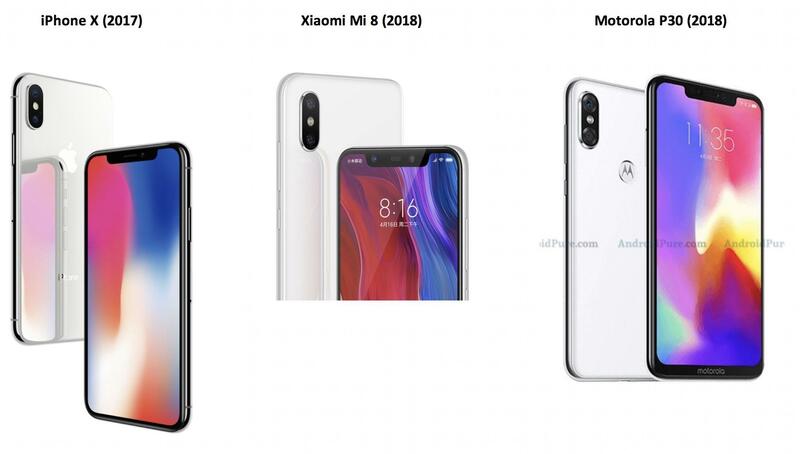 What that trio of images doesn't tell you however, is that Xiaomi and Motorola (and the rest) have many phones on the market at the same time and a lot of them wouldn't make it into that trio! What is more, they often look like other Android phones! Trends are trends and manufacturers follow what sells. Apple only releases two (now three) phones a year. If it released more it could vary designs a little more and they would very probably look like some variant of Android phone. The whole 'knock-off' thing is absurd. Especially when you expressly go out hunting for something that shares the same design characteristics as an iPhone and have to wade through designs that have no such resemblance to them just to reach your examples. That doesn't mean there aren't deliberate 'copies' on the market or manufacturers that take inspiration from certain models. There are but they also cover Android phones. It isn't 'everyone copies iPhone'. This is a design issue and we have always seen it. From tables, chairs, lights, cars etc. Obviously in the case of phones, there is a general move to full screen fronts so at first glance there will be even less to differentiate them. That means more emphasis is put on the rear and there are a lot of designs out there already and once again there is overlap but this time, and as would be expected, between Android phones. Now, by the time Apple's tri-camera offering appears, plenty of Android phones will have them and in plenty of designs. Apple will even have some of those designs in its labs. I do not doubt they have P20 Pros to evaluate and it is possible that Apple could release a design that has already appeared on an Android phone. Lilke I said, designs are limited and will overlap at times. People follow trends and that also leads to more manufacturers picking up on the trends. Last year Huawei released the Twilight gradient effect to critical acclaim. By the end of the year many manufacturers had gradient finishes. Huawei has been using special finishes for years now. In fact it wasn't technically the first with a gradient either. It doesn't matter. India for instance supplies the world with cheap prescription medication because their patent laws work differently than ours. We won't let them export them to Americans -- but the rest of the world benefits greatly from much reduced health care costs. This article from the BBC confirms my suspicions that Trump's case against Huawei is mostly a nationalist rant. That is: fear of a Chinese company having control over an essential part of our infrastructure (rather than the trash talk of spying and ip theft) In other words: it's not about anything going on today or that has gone on. It's the nationalist's fear that a non-U.S. company will have control of essential infrastructure. ... Now that is a discussion worth having. Unfortunately, it doesn't look like we will ever have it.